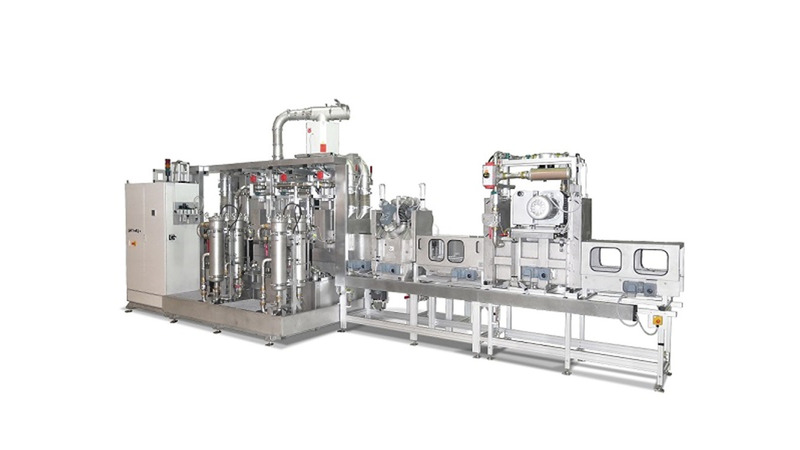 High cleaning quality and short cycle times in combination with low space and energy requirements, and this for the lowest possible investment. In cycle times under 60 seconds the system removes dirt and clamping chips from the workpieces in several zones and finally dries the parts. Maximum 600 microns particle size after cleaning was the challenging quality specification. On a specially designed cleaning pallet, the turbochargers are very quickly fed through the machine via chain drive. In the individual process zones, the cleaning platforms are decoupled from the chain and are individually movable. This allows optimal alignment process to spraying technique. Thanks to the very quick part transport, the available processing time in each zone can be better exploited. This construction also allows flexibility for different type turbocharger, which can be cleaned in the washing machine. The spraying technique is divided into three areas. Two of them work with low pressure and a chamber is equipped with a high-pressure cleaning system. This one works with pressures below 200 bar and removes reliably all clamping chips from the workpieces. Each process zone has been constructed so that the water quantity and the pressure level have been very reduced to the real requirements. Much attention was paid also to the entire air flow inside and outside the machine. With a reduced quantity of water, divided into two baths, you can expect manageable energy costs in daily operation. Bag filters perform the filtration and the bath heating is electric. In the drying zone, optimized air quantity exhaust technique and a vacuum chamber are used. In the drying zone, optimized air quantity exhaust technique and a vacuum chamber are used.